Recommended Name: � the Old Bavarian pattern. Its roots go back to the early 16th Century. Most Kings, Ober and Unter are already present on its predecessor, the Augsburg Pattern (cf. 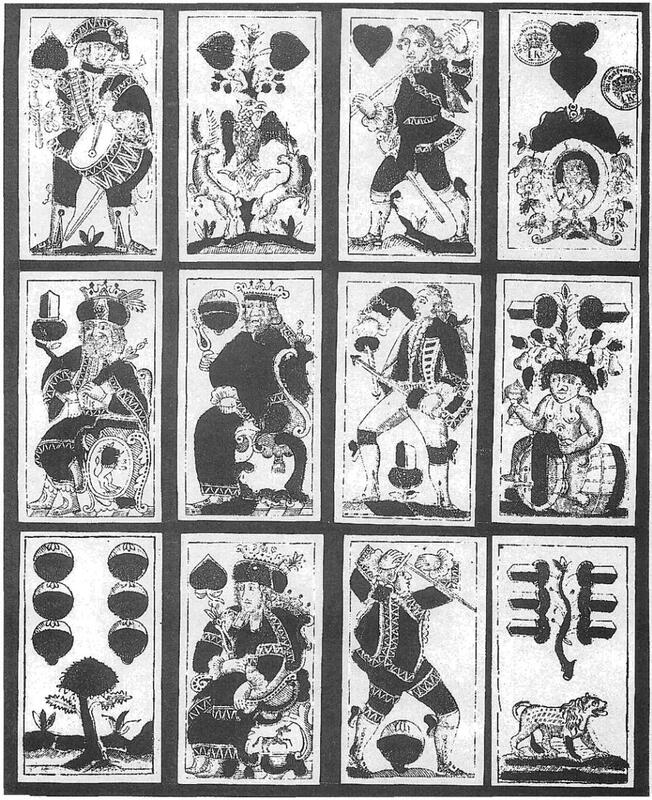 Hoffmann, Altdeutsche Spielkarten 1500-1650). From the Old Bavarian Pattern stem several regional patterns, like the Bavarian, the Bohemian (or Prague), the Franconian, the Salzburg, and the Tyrolean Pattern. Except the last named, these patterns are still in use today. The Old Bavarian pattern settles down around 1700. From then on the drummer (Ober of Leaves), the two fencers with two weapons each (Ober and Unter of Acorns), and Bacchus astride a wine-barrel are there (cf. Radau/Himmelheber, Spielkarten, Nos. 36 to 40). The pattern was produced in the old Dukedom of Bavaria and its adjacent countries, where the same dialect prevailed: Habsburg Tyrol, Salzburg, and parts of Bohemia adjacent to Passau (where German was spoken until 1945); possibly even parts of Upper Austria. Around 1800 the above named regional patterns succeed to the Old Bavarian pattern, which so far has not been traced beyond 1850. 36 cards: Daus, King, Ober, Unter, 10 to 6 in Acorns, Leaves, Hearts, Hawk-Bells. Standard format: 55 x 98 mm. Tobias Fetscher (?) in Augsburg c.1700; Andreas Benedict Göbl in Munich c.1765; Johann Georg Felser in Ingolstadt c.1790; Joseph Henseler in Waltenhofen (Kempten) c.1790; Michael Schatzberger in Passau c.1790; Karl Albrecht in Bozen (only childrens' cards) c.1790; Jacob Vogel in Bregenz c.1790. Cards by Conrad Jegel, Nürnberg, c.1850 (Stadtmuseum, München).